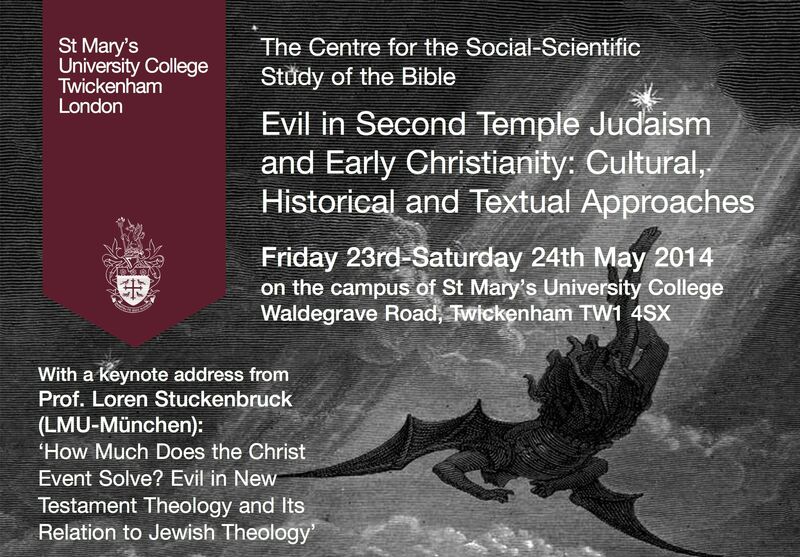 I’m delighted to report that the first conference organised by the Centre for Social-Scientific Study of the Bible at St Mary’s University, Twickenham was a resounding success. About fifty of us met to hear papers and engage in fascinating conversation about the topic of evil across a wide range of texts in the Second Temple and early Christian period. My esteemed colleague Chris Keith had done a masterly job in putting this together. Here are some notes on papers which caught my ear—that’s not to say that others weren’t good (they were), but you’ll have to wait for the conference volume (due out in the WUNT series from Mohr Siebeck, hopefully early in 2015) to see them. For the full programme, see here. Pride of place belongs to Loren Stuckenbruck’s scintillating keynote paper, ‘How much does the Christ event solve? 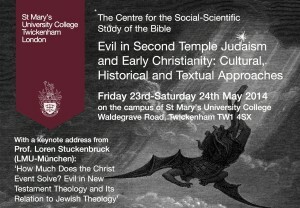 Evil in NT theology and its relation to Jewish theology’. Loren has a masterly grasp of the Second Temple literature, and here he argued against the common tendency in (especially, Christian) scholarship to assume that the Christian solution to evil does something that the Jewish solution cannot do, rather than offering a different solution to the same issues. 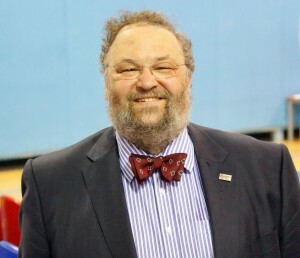 He presented a good case that Jewish and Christian authors are addressing the same or similar questions about the nature of evil and its persistence in the world, but offering different solutions, and argued that scholarship should engage more carefully with the two sets of texts and be more even-handed in engagement with them. As you can imagine, in the discussion time, James Crossley was heartily in favour of this approach (see his JSHJ article about ‘very Jewish’ in NT studies). We had two interesting papers on evil at Qumran from Jutta Leonhardt-Balzer and Benjamin Wold. Jutta gave us a very helpful overview of key texts, notably 1QS and 1QM, and Benjamin focused on 4QInstruction, a fragmentary text which includes some use of the ‘evil inclination’ (yetzer r‘). Christopher Rollston sketched the rise of ‘the Satan’ through key OT texts, noting the way that Ha Satan first appears as an adversary who is present in the heavenly court (Job 1–2) and then develops over time into the opponent of the people of God found in the NT texts. He covered only the OT texts here, and we must hope that he will find time and opportunity to paint in the whole development. After a most enjoyable evening at La Dolce Vita, with good Italian food, wine, beer and good conversation, we focused on the Christian texts on Saturday. We began with two fine papers on Paul. Chris Tilling gave us an excellent overview of evil in Paul, beautifully organised around three topics with six sub-points in each (yes…666). Chris argued that the central problem posed by evil in Paul’s letters is captivity, and thus the central theme in Paul’s solution is freedom. He then sought to locate ‘justification’ and the δικαιόω word-group within this framework, criticising en route both old and new perspective approaches to Paul. This paper alone was worth the price of admission on Saturday, and it will be good to see the fuller version in print. Eddie Adams, newly promoted to Professor at King’s College, London, gave us an excellent discussion of Romans 8:20-22, cogently critiquing Christopher Southgate’s recent argument that Paul here assumes a creation which included death, rather than death being a consequence of the fall. Two papers gave us insights into the text-critical and artefactual (if that’s a word!) impact on this conversation. Tommy Wasserman gave us a masterly discussion of three key textual variants where it appears (using the criterion of difficilior lectio potior) that later scribes ‘softened’ texts which appear to associate Jesus with evil: Matt 27:16-17; Luke 23:22; and John 13:26. Chris Keith gave us a fascinating discussion of the early Christian practice, criticised by Chrysostom, of keeping copies of Scripture or parts of Scripture in Christian homes, or using them as amulets, etc., to protect from evil influences and Satan in particular. A key thought for me was that Chrysostom commends protection by knowing the contents of the Scriptures and internalising them, rather than simply possessing the artefacts. We had a stimulating trio of papers on the Gospels from James Crossley, Chris Skinner and Jonathan Draper. James looked at the theme of the healings of Jesus and how release from Satan is envisaged. Chris compared Mark and John’s conceptions of evil, arguing that Mark sees Jesus principally as overcoming Satan, whereas John’s focus is on overcoming the world. Jonathan presented part of his continuing study of comparing Philo and John by engaging with darkness and non-being as a theme in John and Philo in relation to evil. A fine pair of papers on James, a neglected book for study on this topic, complemented each other well. Nick Ellis gave us a good overview of the theology of evil in James (the theme of his Oxford DPhil), and Susanne Luther followed this by a careful exegetical study of James 3, focusing on speech ethics (the topic of her PhD thesis on Matthew, James and 1 Peter—soon to be published by Mohr Siebeck). Dieter Roth and Paul Middleton took us into the sub-apostolic period with papers on Marcion’s conception of the OT God and the overcoming of the devil in the Acts of the Martyrs. Dieter’s paper is part of his wider study of Marcion, and was wonderfully lucid and clear. Paul’s paper is part of his wider study of martyrdom in early Christianity, and likewise laid out the texts and commented on them with commendable clarity. I myself contributed a discussion of evil in Ephesus in Acts 19; this was good fun to do, and enabled me to engage with issues about magic, demonisation and deliverance, and the Artemis cult in the context of Luke’s Christian exclusivism. This was helpful to me in developing my thinking towards my commentary on that chapter in due course. This was a terrific conference, and our three doctoral students Sarah Prime, Helen Morris and David Smith deserve great credit for handling the nuts and bolts of the conference organisation and running so well. Chris Keith deserves thanks for having the brilliant idea of the theme and bringing such a good set of speakers covering a wide range of topics—the book, when published, will be a splendid resource for scholarship in the future, and should provide the springboard for lots of future work. Thanks for this, Steve, and your kind words about my paper! One of the more enjoyable conferences I’ve been to in quite a long time. Very well done, Chris and Steve! 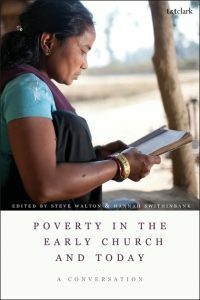 Any possibility of you publishing your paper on Acts 19 here on this website? I’m revising for publication, Richard. I’ll hope to publish a version of it online in due course.